The Elago Leather Flip Case caught our attention because it’s a slimline folio design that is made from vegan faux leather for £39.99 or €39.99. Ordinarily we disassociate ourselves from this style of case, but might this be just what we’ve needed the whole time for front and back protection reassurance? Champagne gold on brown or metallic grey on black colour schemes are the choices available and we have the former which we think looks quite graceful. 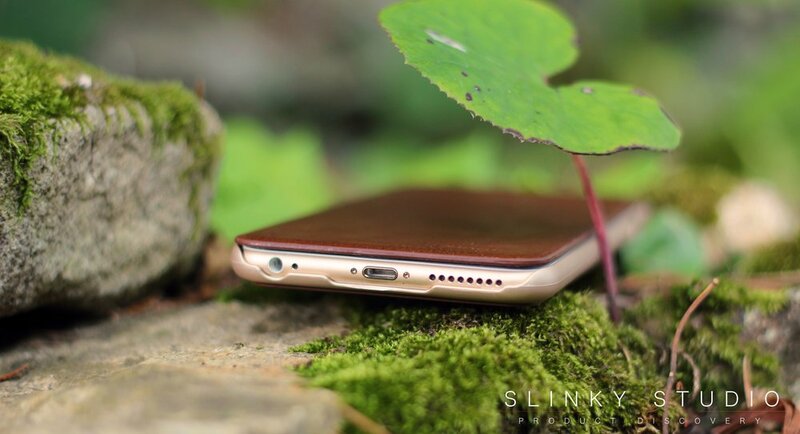 Styling aside, the Elago Leather Flip Case doesn't mess about with wallet functionality or masses of padding and material, but instead a thin silicone shell straps the 6.9mm iPhone 6 or 6s Plus into the detailed faux leather wrapped case to bring the total thickness to 12mm. It’s noticeably bulk free in hand and is more similar to operating an iPhone with a skin/shell case than a folio one, albeit the dangling lid is irritating to those of us who are silicone skin loving case users. Furthermore, pocketing this affair isn’t a struggle, thank goodness, if you’re already creeping the enormous Plus iPhone models into trouser pockets. Using the Elago case every day during the past month has been mostly a pleasure, although not quite as novel as the Moshi SenseCover Case with its screen cutout to read the time, and opening and closing the lid is a plain task with no buckles or straps slowing us down. You can also take phone calls with the lid shut thanks to a speaker cutout on the front and there is an internal card slot pocket that can accommodate a single card (a seemingly guaranteed screen scratcher). Locating all button controls is easy and docking accessories hasn't been problematic. Also the rear camera cutout doesn’t ghost the lens. What more could we ask for, right? 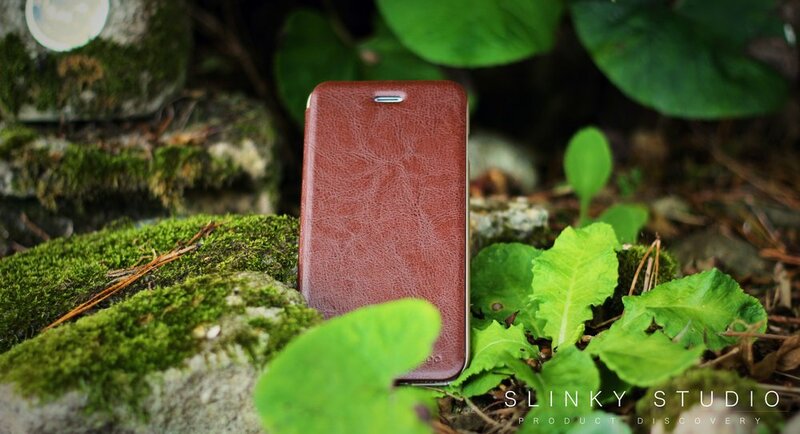 Well, the Elago Leather Flip Case is a little on the slippery side to hold, but that’s a byproduct of the rustic leather-style portrayed. Most unfortunately though, we weren’t too pleased to see signs of wear after just a month of usage. The silicone shell has split along the side volume controls in two areas and she we took the phone out of the case yet it split along the top. Furthermore the faux leather, whilst seemingly resilient to wear in itself, has shown signs of peeling away from the rear of the case. This is worsening the more we open and close it. It seems profoundly obvious that the spine of the case should be the stress point of contact and that it shouldn't be reliant on simply being glued to the back when handling all thedownforce stress, especially as the lid of the case is so large that it is left to dangle when open most of the time. Obviously a key benefit of folio styled cases is that both the front and back are covered and in this instance there are two layers of protection. However, this is all very well and good in the pocket, but if you drop the case, the front, which isn't held shut by anything, could theoretically open and leave the screen fully exposed on landing. Admittedly this is a bleak worst-case scenario outcome and in general day to day desk to pocket travelling it’s reassuring to have nearly all-round cover. The large 5.5” iPhone screen is definitely better protected when carried in bags or laying on surfaces. 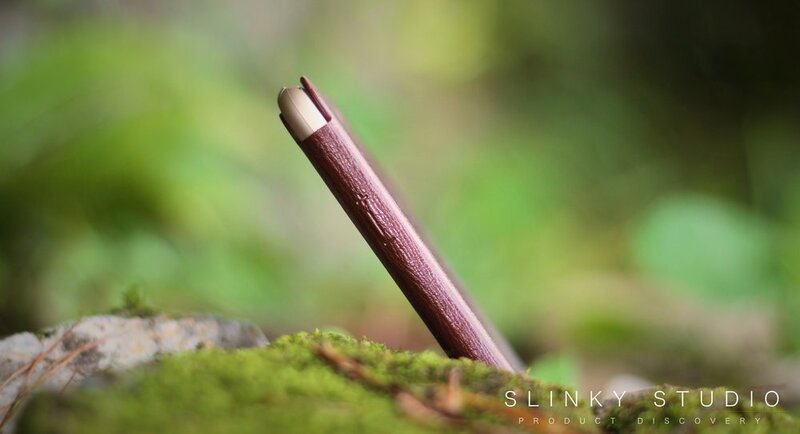 We like the idea of a slimline folio case on bigger smartphones like the iPhone 6/6s Plus models. The Elago Leather Flip Case gets straight to the point by removing thickness from a folio case design and lets you get on with accessing your phone and its functions easily. However, the quality of build, as explained above, is definitely not of the best standard and the case is likely to be left in a sorry state after 3-5 months of use.